Fifty kilometres beyond the citrus farming town of Ceres, my partner and I arrived at Inverdoorn Game Reserve & Iziba Safari Lodge – a pristine wildlife sanctuary of vast open spaces guarded on all sides by majestic mountains. 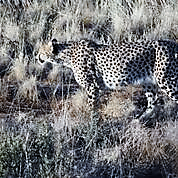 On this modern Big Five reserve we enjoyed a truly hospitable blend of wildlife, fine dining, luxury lodging and fascinating insight into the preservation of the world’s fastest land animal – the cheetah. 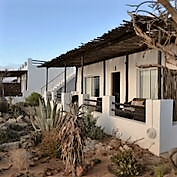 Our comfortable bungalow is equipped with air-conditioning and a fireplace – the desert-like terrain means the mercury can really plummet between dusk and dawn. 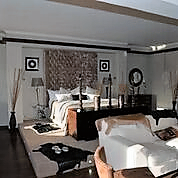 Two lovingly restored residences, each with eight spacious rooms, make the ideal stayover for families. 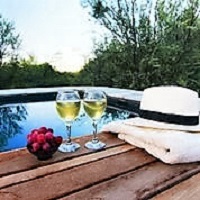 But rather leave the kids at home, especially should you choose to stay in one of three exquisitely appointed five-star luxury chalets or the romantic ambassador suite – all boasting splendid wilderness views from their furnished rooftop terraces. 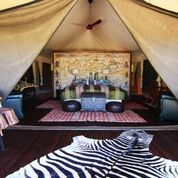 At Kuganha Tented Camp, also within the reserve, you’ll be put up in opulent safari tents with African décor reminiscent of the Great Explorers. We’re awake with the birds in the morning for our guided 4×4 game drive, when we encounter buffalo, rhino, lion, zebra, giraffe, hippo – and of course the remarkable cheetah. Later, our evening game viewing adventure concludes with a gin and tonic as we watch the crimson sun setting over the glassy reservoir. 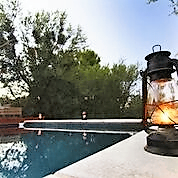 From there, it’s a scrumptious three-course dinner before we turn in for the evening – but not before we take some time to marvel at the oh-so-bright stars dotting the unpolluted Karoo sky. 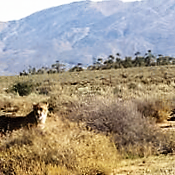 Inverdoorn is home to Western Cape Cheetah Conservation, which was set up for the purpose of rescuing, rehabilitating and reintroducing these fascinating felines back into the wild. We enjoy the once-in-a-lifetime opportunity to walk and interact with some of them under the supervision of their handlers. And what humble and discerning creatures they are! 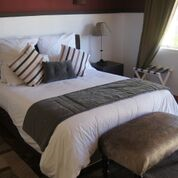 Aesthetics at Inverdoorn have emerged out of a respect for the natural environment. In the prized botanical gardens, swollen succulents laze at the feet of tall cacti in a Zen-like labyrinth, where eclectic décor and rustic furniture create an avant-garde desert eco-lounge. The inviting sapphire pool offers respite from the heat on balmy afternoons, and is a haven for relaxation and sun-worshiping. Multiple al fresco dining areas allow you to soak up the scenery at different locations across the reserve, where the sun’s ever-changing position sets the mood according to the time of day. 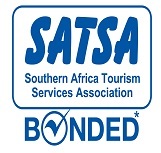 At mealtimes we enjoy a mix of French and southern African cuisine under the shade of large Bedouin tents, in the firelit boma, and around the swimming pool at breakfast. Our convivial hosts assure us that the cosy indoor restaurant can be used should the weather take a turn. 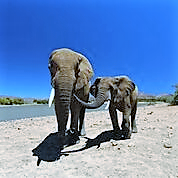 For a first-class Big Five safari experience less than a three hours’ drive from Cape Town, visit Inverdoorn Game Reserve & Iziba Safari Lodge and let nature take its course. 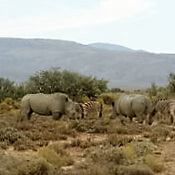 Images with compliments from Inverdoorn. 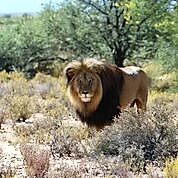 For a first-class Big Five safari experience close to Cape Town, visit Inverdoorn Game Reserve & Iziba Safari Lodge. 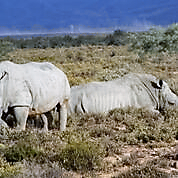 The reserve is a wildlife sanctuary.